When you’re looking for luxury appliances for your kitchen, start with a Smeg cooker. 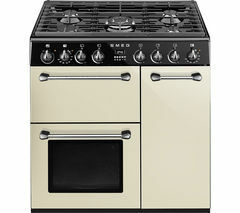 Used by budding chefs and amateur cooks alike, Smeg cookers are stylish and practical and a great addition to any home. If you have a big family who love home cooked meals, or if you regularly invite guests over for dinner, a Smeg cooker will allow you to flex your culinary muscles and get creative in the kitchen. You can cook anything from roast dinners to fried breakfasts with ease when you have a Smeg cooker. Smeg cookers look great and come in a variety of styles including professional stainless steel, classy cream & black and even a fun retro-style pink, so no matter how you’ve chosen to decorate your kitchen, you’re bound to find a Smeg cooker that complements your carefully chosen design. Smeg cookers are available in a number of different sizes too, but even the most compact versions still have plenty of room inside. If you’re looking for a stylish cooker that can handle big meals and dinner parties, take a look at our collection of Smeg range cookers. 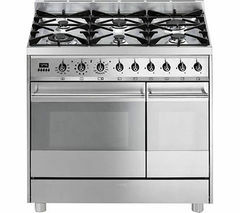 And if you’re looking for an affordable and reliable cooker for your kitchen, check out our Belling cookers. Smeg cookers are ideal if you take pride in the look of your kitchen or you want a luxury cooker to complement your other appliances.